On this blog I favour other more structured alternatives, but for making easily editable plans, Google Maps is great. I thought I’d share a few of the resources I put together for planning my resupply strategy. 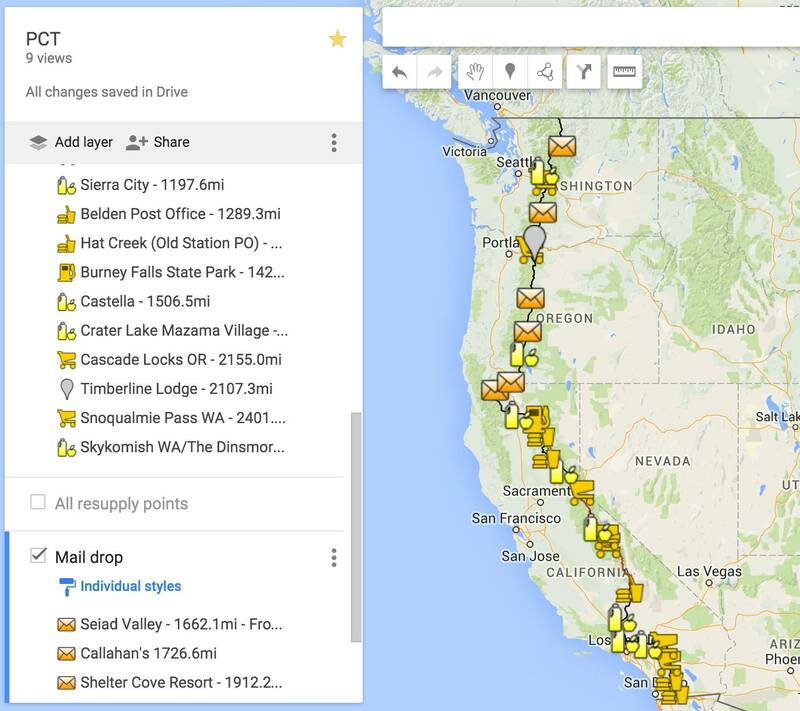 PCT waypoints in gpx, kml and geojson. First of all I wanted a low quality line of the entire trail. I couldn’t actually find this anywhere, I only found waypoint collection and way too detailed for the purpose of a simple overview. Finally after some searching and conversion efforts I managed to get an importable trail line in the KML format. Next up I needed a list of resuppply points on the trail, and found this map already shared by someone else. I just copied it, exported it and re-imported it into my own map. The waypoint set also contain some basic information about mail drop addresses, opening hours etc but I wouldn’t trust it’s current. Now I had everything I needed to get a good overview of my options. To get a better idea of how long it takes between each resupply point and how far away from the trail they are, I used Craig’s PCT Planner and started looking for resupply points which were close to the trail. I’d rather not pick a town which requires a long hitchhike unless I really have to. For additional comparison I also looked up reviews of every stop to see how feasible it would be to resupply there. Basically my first step was to highlight the towns close or on the trail that had affordable resupply options. After that I started looking at the most popular mail box resupply stations on Halfway Anywhere and then comparing how far they were from the next/previous option. The goal was to stay within managable resupply distances while minimizing time off the trail. I ended up picking 5 places where I would ship food instead of buying. I much prefer buying my supplies while on the trek because of the shipping hassle as a non-resident as well as the freedom of an open time schedule. Resupply option: Impossible, a favorite on Halfway Anywhere. Resupply option: Impossible. Trying to avoid Sisters. Resupply option: Impossible. Trying to avoid Ashland but if I need to buy new shoes, which I might, I’ll skip this box and ship it somewhere further south when I might enjoy a change of food. Resupply option: Expensive, a favorite on Halfway Anywhere. In addition to these I’ve also mapped all optional stops where I might go for either snacks or a larger resupply depending on how my pace advances during the hike. Finally I’ve incorporated all of this in a Google Map. The resupply stations I’ve also imported into the BackCountry Navigator App on my phone. For offline maps I found a great downloadable atlas which contains only the necessary topographical tiles (637mb).